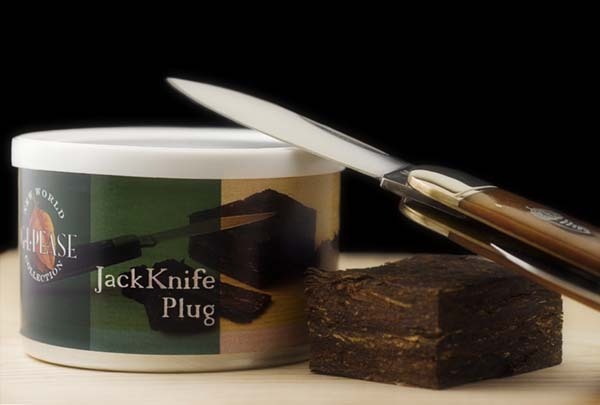 For those who like the idea of the original JackKnife Plug, but don't want to fuss with the cutting, the same great blend is available in a ready-rubbed form. Now, you can take JackKnife ReadyRubbed with you on the go. The constituent tobaccos are pressed into blocks, held under full pressure for several days to allow the flavors to integrate, and a gentle fermentation to take place. The blocks are then cut, and the slices tumbled into its final form. Even though the recipe is the same as the plug's, the smoking experience of this version is slightly different. The virginia flavors are a bit more up front, with more subtle, deeper notes in the background. JKRR is an easy packing, rich virginia blend that offers a deep, satisfying smoke. 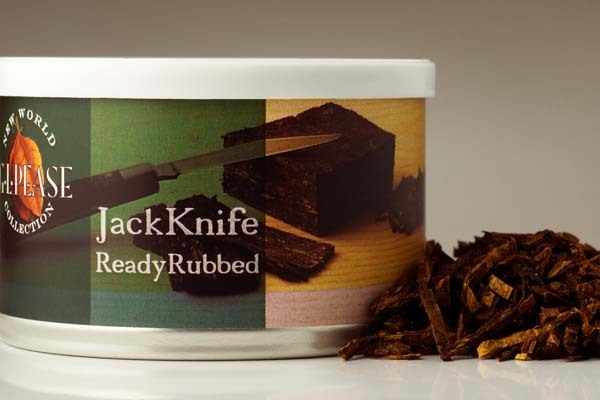 JackKnife ReadyRubbed was introduced in November, 2011. Triple Play — Ripe red and bright flue-cured tobaccos are joined by piquant Acadian perique, and a balanced measure of smoky, dark-fired Kentucky. The leaf is pressed and matured in cakes before being cut into 2oz bars, resulting in a bold blend for virginia and periqe fans. This all-American plug is a winning play, no matter how you slice it. (More coming... Meanwhile, check out Kevin Godbee's excellent review in PipesMagazine.com. 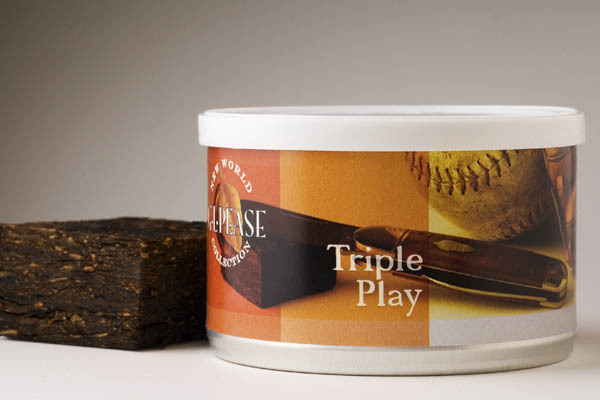 Triple Play was introduced in May, 2011. The first blend in the New World Collection from G.L. Pease, JackKnife Plug is an all natural blend of dark-fired Kentucky leaf, and ripe, red Virginia tobaccos, layered on a central core of golden flue-cured leaf, providing deep, earthy flavors with a hint of bright sweetness. The tobaccos are pressed and matured in cakes before being cut into 2oz blocks. JackKnife is a stout blend. The dark-fired leaf adds a subtle smokiness and a subtle finish reminiscent of dark chocolate, while the Virginia tobaccos provide a sturdy backbone. While other producers would simply mix the leaf before pressing, my choice to separate the dark-fired and red virginias from the core of bright is not just an aesthetic one. I wanted the bright's flavours to retain some of their clarity, mingling on the palate with the deeper tastes, not in the plug. Producing it this way is more difficult, but the result makes it worthwhile. The visual difference is not as obvious as it would be if the cakes were not given time to age, as the tobaccos all darken during the fermentation, but the subtle contribution to the overall taste profile remains. Slice it thick and rub it out for a ribbon cut, thin for a shag, or chop it into cubes. The choice is yours. JackKnife Plug was introducd in January, 2011. Only New World tobaccos will be used in the blends of this new collection: fine burleys, flue-cured virginias, perique, Carolina brights, dark-fired leaf from Kentucky, and perhaps some Maryland. No orientals of any kind will sneak into the mixtures, so Latakiaphobes can rest easy. This collection will probably never contain more than five or six blends, but each will be special in its own right, and unique in the world of tobaccos. Even with a seemingly fairly limited palette, the possibilities for enticing new blends are many, and I'm really excited about the ones I've been working on. It's hard to say too much at this early time, but some of the prototypes show real promise, and at least a couple of them will be added to the collection in the coming months. Stay tuned. JackKnife ReadyRubbed is a bit of a surprise. Though it's the same blend as that used for the plug, the difference in production methods results in a somewhat different taste experience. Early aging tests tell me that the ribbon form will diverge still further from the plug as time goes on. Try them both! JackKnife Plug will age. That's about all I can say about it at the moment, since I'm really treading on new ground with it. I don't know if it will age faster, or more slowly than a ribbon cut or flake tobacco, but I do know it will age differently, and I'm looking forward to seeing what will happen. Experimentally, I've put aside a bar of the stuff, and the same quantity sliced fully rubbed out. In a couple years, I'll know more. Watch this space.